With a planet under attack a king must make an important decision, dare he release the criminal Explodemon from cryogenic stasis? Even though he is very dangerous, Explodemon may be the planet’s only hope. Explodemon comes from the London-based makers of Fluidity and the BUZZ! series, Curve Studios. Many have compared this title to ‘Splosion Man and Capcom’s suspiciously similar iOS title MaXplosion, calling Explodemon another ripoff of the indie darling. Luckily I haven’t played either of those games so I’m coming into this review completely fresh and without bias. 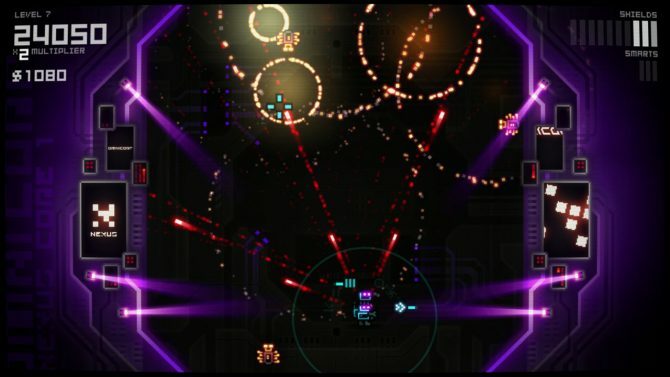 In Curve’s defense, the first Explodemon prototype was developed in 2005. Explodemon himself is a fun character. It’s not explicitly stated why he was locked away, but you can figure it out. While he can usually control his explosions, they occasionally go off on their own. It’s not just Explodemon’s physical abilities that are volatile, but also his personality. Believing himself to be the big damn hero-type, Explodemon rockets through town destroying enemies with little regard for collateral damage or civilians who may be in his way. He will often spout such haughty yet broken phrases as, “Move stage left, dancing foolish, and prepare for AWE to be STRICKEN! !” One innocent bystander enlightened me as to how much he actually enjoys alien invasions because they’re loud and allow him to build new things. I proceeded to destroy his fort as it was blocking my way and I have a PLANET TO SAVE. The boy cried, “NO! MY FORT!” and Explodemon responded, “Explodemon waste no times! I am Supercharge Heroic with tremendous power for forces of goodness! !” I then carried on my merry way. He also once compared a situation where I had to fight a small yet powerful foe to “David and Gonzalez.” He’s obviously crazy, but this is also a fun throwback to Engrish-translated games of the past. 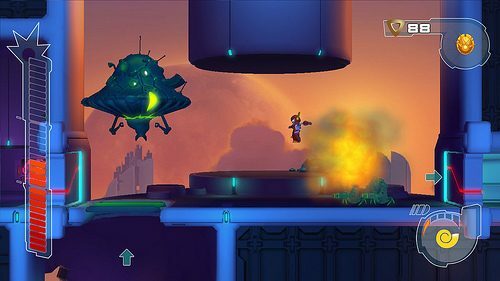 Explodemon gameplay is very reminiscent of classic SNES and NES platformer/shooters, with a bit of a puzzle element tossed in. Explodemon’s only means of attacking are by exploding. Having an attack limited by proximity is interesting and allows for some cool puzzle sequences. 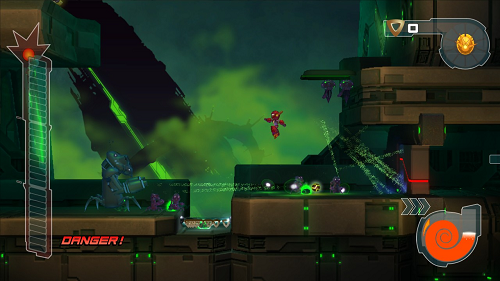 The explosions can also be used to leap across gaps, fling enemies and objects across the room and destroy barriers. There is a shop where the player can unlock more abilities, but as in many games with unlockable moves many of them are useless and I largely ignored the whole thing. The shop felt pretty tacked on and like an excuse to have more collectables in the game. Collectables are scattered throughout the level. They don’t provide any real reward other than 100%-ing the game, and you all know how much I hate collect-a-thons. But in Explodemon they’re usually received when solving some kind of puzzle or platforming challenge. 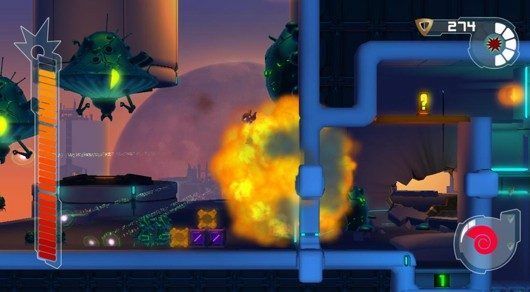 While in most games they’d just be splayed out across the level, Explodemon provides a journey that’s much more rewarding than the destination. I could care less about 100%-ing games, but when I’d see a glowing orb behind a wall with no apparent way to get it, I couldn’t help but restart the level several times until I found out how to get it. Explodemon has nearly all the classic traits of the 16-bit action-platformer. The only thing missing are the boss battles. In games like Mega Man, Stryder or Castlevania the bosses are some of the most memorable parts. Each one is more exciting and original than the last. Explodemon has boss fights, but they’re all with the same guy and you fight him exactly the same way each time. The landscape changes a bit, but that doesn’t switch up the experience nearly enough. I’d like to have seen a whole line of enemy robots, each with their own powers and strategy for defeating them. The fights are fun, but get old quickly. Each battle is fought by tossing explosives at the enemy. This is fine for one fight, but it kind of demeans the other gameplay. As I progress through a game, I want to use the moves and tactics I’ve learned to defeat the big bad. If a guy keeps coming at me the exact same way, of course I’ll beat him each time. Can you imagine if every fight in Shadow of the Colossus was won in the same way? Also separating Explodemon from the classic games it’s emulating is its difficulty. For most of the adventure, Explodemon is a breeze and the second of the three worlds really drags. 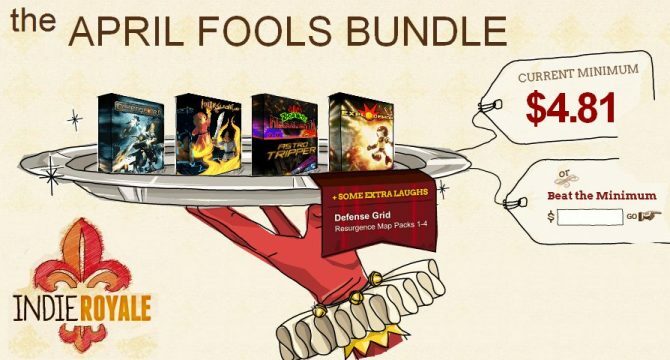 Those last few levels will tear you apart, though. At the end is when the game really gets to breathe and feel challenging. The final stages really embrace the genre’s roots and feel like when I’d hear a Super Nintendo controller creak under my frustrated thumbs. The game keeps from getting too daunting with plentiful checkpoints. Explodemon can infinitely restart a segment of the level after dying or at any time from the start menu. Each section is pretty small too so it never feels like I’ve lost too much playtime from dying. And nearly every death feels like it was my fault and few are cheap pit-deaths. The few times where I felt like it was more the game’s fault happened because the controls are mapped to the left analog stick rather than the D-pad. The thumbstick can’t give me the control these classic platformers require. While the level design remains consistently fun with inventive puzzles and exciting platforming, the aesthetic of the game leaves me wanting a little more. 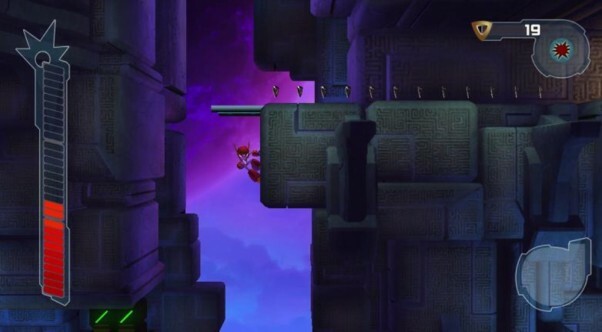 Most of the levels look exactly the same, as do the characters. Stages take place in actual buildings that would exist in a society like a TV station or Hall of the Elders, but nothing about the level design is indicative of that. The 2D-animated cutscenes are cartoonish and funny, but they have that kind of colorful flash-based animation we’re so used to seeing in smaller budget games. The game’s inspiration is obviously in Japanese games and anime, yet the aesthetic doesn’t push that farther than Explodemon looks kinda robot-y and there are Japanese characters in the game’s logo. I would like to have seen some more manga influence in the animation and character design. This is purely a matter of taste, though, and I’m sure no one else is geeky enough about animation as I am to notice the two disparate styles. Explodemon is a very fun game and ends just when it needs to. It’s fairly short, but if it were any longer I would have gotten very bored with it. It’s definitely got enough to warrant the $10 price tag.